The new-generation Mercedes S-Class made its world debut on May 15th, in Hamburg, Germany and it comes with lots of good news. Along with the new S-Class, Mercedes is using this new sedan to revive the old Maybach brand. The new model and sub-brand, now known as the Mercedes-Maybach S-Class, promises to be one of the most luxurious machines ever created.The new Mercedes-Maybach S-Class sees a size increase of 8-inches in both overall length and wheelbase. This adds more interior space for the discerning passenger who demands nothing but the greatest in luxury. 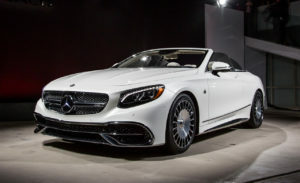 There is a range of models that scales from the S500 to the S600, with engine choices that include eight or twelve cylinders.Mercedes officially unveiled the new car in both the USA and China nearly simultaneously at both the Los Angeles Auto Show here in the states and at Guangzhou in China. It’s a really long car, which makes an impressive statement at first glance. One glance and you find a striking resemblance between the new Mercedes-Maybach S600 and the S-Class. The front is extremely similar to the S-Class — like its face and headlights, with just the redesigned grille and bumper setting the Maybach apart. In fact, it still carries a Merc TriStar emblem on the bonnet, instead of the more premium Maybach badge; which is a disappointment. As expected, the rear design also has reminiscence of the S-Class and comes without the Maybach ornamentation on the boot. The brilliant proportions on the side of the Maybach give it a lasting impression. This thing is big… long to be more accurate. So, the S-Class platform has been stretched by another 207mm and its rigidity has been reinforced further. Just notice the size of the rear doors and how the third window spills over till the C-pillar. And the final touch are the special 19-inch alloy wheels, which can be upgraded to meaner 20-inch ones.It’s more elegant than the now seemingly modest S-Class, and puts a stretch limo to shame with its magnanimous five and a half metre length and close to 2.5 tonne kerb weight! The cabin is even more luxurious than that of the S. It can be trimmed in a wide variety of leathers, woods and assorted shiny bits and the list of additional luxury fittings is long and comprehensive. Selected highlights include air-conditioned, heated and massaging seats for all passengers, a system that pumps scented, ionised air around the cabin and a 1540-watt Burmester 3D surround sound system with 24 speakers. The two individual rear seats can be reclined even more to 43 degrees, due to the longer wheelbase. Missing, however, are the champagne flutes the earlier Maybach was famous for, and a refrigerated compartment, that should have been there behind the central elbow rest. The two thrones at the rear are good enough to seriously embarrass most first-class airline seats, especially for sumptuousness and opulence. The fully reclineable chairs are finished in the softest and most supple Nappa leather and with all the extra legroom available, you can really stretch out, and even kick your legs out. You also get fold-out tables, a huge sunroof and a moonroof with photo chromatic glass. And, for the first time in India, you get inflatable seat belt airbags too, or beltbags as Merc calls them. The entertainment system at the rear though is a bit fiddly to use and the remote-based system feels quite antiquated. The Mercedes-Maybach S600 is powered by a stonker of an engine. The 6.0-litre V12 petrol engine belts out a massive 523 HP of power between 4900-5300 RPM and 830 Nm of torque from as low as 1900 RPM, till 4000 RPM. The engine is matched to a 7-speed dual-clutch automatic transmission. The S600 is heavy but still it manages a 0-100 km/hr timing of 5.04 seconds which is brilliant. The motor has amazing power delivery and it moves the Maybach effortlessly. Start the car, switch to D and a slight throttle input is just what is needed to get the car moving for decent city speeds. On the highways, the Maybach S600 showcases what kind of a beast it is. Go full throttle and the car will accelerate ahead like a bullet. The V12 engine is no doubt damn powerful. Still it manages to reach extremely high speeds with a lot of ease and this is quite commendable. Since most users of the saloon will be chauffeur-driven, not many of them will put the V12 to full potential. The engine also loves cruising and it does 100 km/hr in 7th gear at a shade below 1500 RPM. There are two driving modes to choose from – E and S. The Eco mode is tweaked to give out good power delivery along with decent fuel economy. The vehicle has an auto switch off function where the engine turns itself off if the car has been idling for long, whether at a signal or in heavy traffic. A slight dab on the accelerator pedal is all that is needed to bring it back to life. In Sport mode, the Maybach S600 goes all the way to the redline before changing cogs. The 7-speed gearbox does a smooth job of changing gears but it is a tad slow in its operations. Talking about fuel efficiency, we managed to extract around 4 km/l under hard driving and around 6.5 km/l under sedate cruising. The V12 engine is quite thirsty and the 80-litre fuel tank gives the car a range of around 400 kms. The ride on the Maybach is, quite simply, great. The 19-inch wheels and the air suspension make sure the ride is plush even over bad roads. The thuds can be felt but over broken surfaces, undulations and small bumps, the car simply glides, no matter what the speed.The good news is that the Magic Body Control finally makes it to India. The system uses cameras that read the road ahead and alters the suspension characteristics. The ride is better than the standard S-Class but it isn’t a huge step up. The air suspension offers two modes as standard ? Comfort and Sport. In Comfort, the Maybach feels relaxed and is best experienced at slow speeds. However, this mode displays quite a bit of body roll.The Sport mode firms up the ride, and interestingly, it also alters how the steering feels and reacts. The whole setup feels a lot firmer and though driver involvement still remains low because of the lack of feedback coming through either the steering or the chassis, it felt a lot more comfortable than before. The long wheelbase does affect handling but it still is very predictable and never a concern. Also one should remember that the Maybach is a car not meant for tackling corners and twisties. But it feels absolutely brilliant in a straight line, even when driven flat out. The vehicle is inbuilt with numerous control programs and restraint systems, which together boost the safety condition to its prime level. Brake assist, hill start assist, and an adaptive brake with a HOLD function regulate hazards when braking and cornering. Airbags shield the front occupants, together with front and rear sidebags and window bags as well. Crash sensors are present in the doors, helping to optimize efficiency when in need of deploying airbags. Also present is a tyre pressure monitoring system, a warning triangle, child locks with a temporary unlocking function, and a closing aid for doors and the boot lid. From the outside, the Maybach is undoubtedly more understated than rivals from Bentley or Rolls-Royce, and there’s no question, the S-class doesn’t have the same snob appeal either. Clearly more special, both on the inside and the out, the new Maybach is also even more impressive than the already class-leading S500. Levels of space, comfort and technology are astounding and the S600 has probably what is one of the best luxury car V12 engines around. The whisper-quiet Mercedes-Maybach, is an even better, more luxurious version of the best car in the world. It really is as simple as that.Mercedes India has introduced two models in the Maybach range, the fully-imported S 600 Maybach tested here is priced at Rs 2.6 crore while the locally-assembled S 500 Maybach powered by a V8 motor is priced at Rs 1.67 crore.